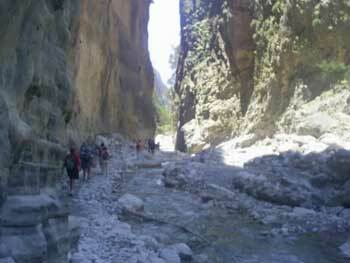 The Samaria Gorge is the longest gorge in Europe, and also the most famous. Thousands of tourists flock there daily in the season to walk from the top to the bottom. For many, it’s the sole purpose of their visit to Crete. Here I’ve compiled a few tips and information that you should consider if you’re going to walk through the gorge. The question of logistics is an important consideration. There is no road between the start and the end of the hike. If you left your car at the entrance, you’ll then have to drive for hours back to the north coast in order to pick it up. For that reason, it’s better to do the walk with either public transport or an organised tour. At the end of the gorge is Agia Roumeli. 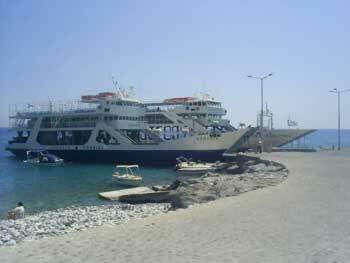 From here you take the ferry to Chora Sfakia. From there, you can take the ferry back to Chania. All told, using public transport, you leave Chania about 6 or 7am and you’ll get back at 8pm. The price for a ticket for the ferry from Agia Roumeli to Chora Sfakia is €12.70 in 2017 (6 Euro for children). The bus from Chania to the entrance near Omalos is €7.50, the bus in tne evening back to Chania from Sfakia is €8.30. 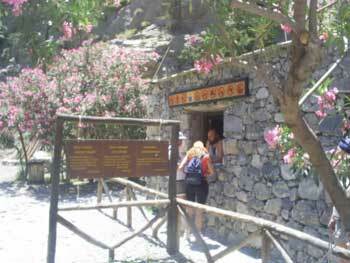 Altogether, including the 5 Euro entrance to the Samaria Gorge, it will cost about €33.50. All prices from May 2017. Prices for organised tours are in the same price range or a bit more, the only difference being that the tour operator has bought all the tickets for you. It’s probably better to get a tour from your base; there’s daytrips from all of the bigger resorts – even as far as Malia and Hersonissos – but these will obviously start even earlier. If you’re moving onto another destination after you’ve walked the gorge, there are also ferries departing Agia Roumeli to Loutro, Sougia and Paleochora. From Paleochora and Sougia you can do the Samaria Gorge with public transport, though ferries are not daily. There are not many watering holes, so be sure to take plenty of water with you! Don’t forget to take food with you, since you can’t buy anything in the gorge. 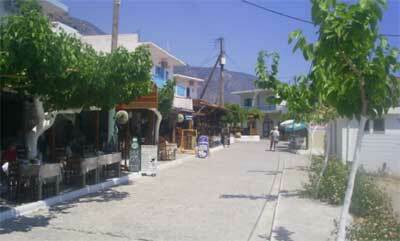 There are many shops and restaurants in Agia Roumeli, but the captive market keeps prices high and quality low. 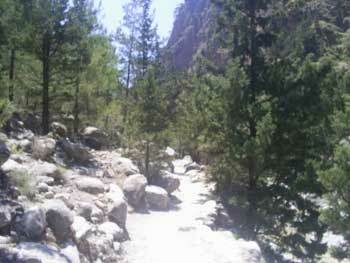 The Samaria Gorge is only open when the river that runs through the gorge has little water. This is the case only in summer. Generally the water stops flowing in the first half of may and starts up again in mid-October. It is strictly prohibited to enter Samaria National Park (the gorge’s official moniker) when it is not open. You will have to pay an entrance fee at the kiosk. Beginning 2018 the fee was €5 a head. Some tour operators include this in their bookings, others not – check with your operator first. It’s forbidden to stay overnight in the gorge. Mountain bikes, open fires and various other things are also strictly prohibited. If you’re caught flaunting the rules, fines are high. There are many rare species of animal resident in the gorge, such as the Bearded Vulture, or the wild goat ‘kri-kri’ (Agrimi). Due to the high amount of people passing through, it’s very unlikely you’ll see them. There are plenty of wild flowers in spring, which make for a beautiful sight, especially the orchids. If you want to go against the flow, you can also hike the Samaria gorge uphill, but be warned – this isn’t easy, and you’ll be going against the vast flow of downhill hikers on a narrow track, which can be irritating. Secondly, it’s not possible to go on to Chania on the same day using public transport – you’ll have to spend a night either in Omalos or at the Kallergi Lodge. 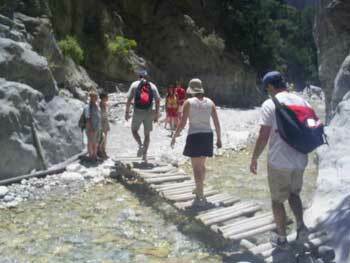 IMPORTANT: Do not underestimate the difficulties of tackling the Samaria gorge. Every year people die there. You have to be fit enough to walk 19km and in summer it can be extremely hot (sometimes 40c and more). 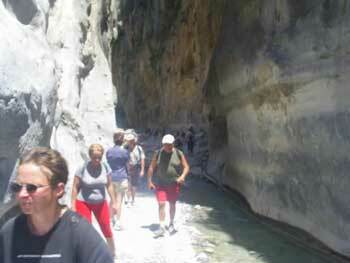 If you are not fit, then Samaria Gorge is best left off your itinary. If you don’t like your hikes to be spoilt by the presence of too many other people, Samaria Gorge is probably not for you either. Why not try one of the many other gorges in the area? They may be less famous, but they will have less people and each is interesting in its own, different way. The Samaria Gorge is 19km long, on a rocky track which winds around the terrain, making it longer and harder than a road the same distance would be. Once again, do not underestimate the distance, even if the Greeks (not notable walkers themselves) tell you it’s no problem. The track itself starts in a huge car park 3km from Omalos in the White Mountains. All buses stop here. The locals call the spot Xylocastro (Wooden Stairs). From here you can walk down the gorge using the wooden stairs in about one hour. After one and a half hours of walking, you’ll reach the small chapel of Agios Nikolaos, which is the first big resting place, where you can stop to take a picnic by the beautiful spring there. Three hours in, you’ll come across an abandoned village called Samaria. Here you’ll usually find water, and quite often some first-aid personnel, a helicopter landing field and toilets. After the village, the most interesting part of the gorge begins. Here on both sides, the rock towers over you from hundreds of meters up; four hours into the walk, you’ll get to the Iron Gate, where the walls are only 4m apart, and still hundred of metres high. After one more hour, you’ll reach the end of the gorge. Altogether the walk through the gorge is at least five hours (plus breaks). There are two tavernas at the end of the track. To get to the port to catch a ferry and to Agia Roumeli is another 2km walk from here. This small village is packed to the rafters with tired, hungry and thirsty hikers from 2-5pm. There are dozens of restaurants and some supermarkets here to cater for the clientele, and prices are pretty high. After the last ferry leaves in the evening, Agia Roumeli is a quiet village. Some houses rent room, and the restaurants are nicer without the big crowds. A nice place to stay is the Pension Oasis. 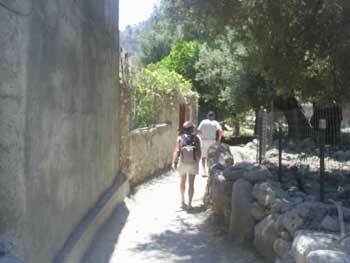 If you’re walking the Samaria Gorge uphill, it makes a lot of sense to spend the night before in Agia Roumeli.